No, I don't know why part of the building is wrapped in plastic, but it's been that way for several weeks. Even though we got about 6 inches of snow overnight, you can see grass sticking up where it's blown off. 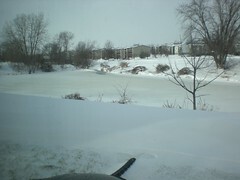 In the picture above, the very "snowy" part is a drift, about knee high. 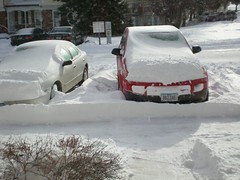 All day, I kept saying I'd go outside and get a good picture -- that drift runs a lot farther and gets deeper. However, since the high today was about 15ºF, with 30 mile an hour sustained winds (not just gusts), the wind-chill was below zero. Taking pictures didn't seem like a good reason to go out! I also considered walking over to the drug store (the grocery store is closed on Sundays) to buy the candy I needed for the recipes I mentioned yesterday -- but that also seemed foolish! I've got some sort of cold-like bug that's been going around at work, so I slept a good part of the morning, and then spent this afternoon working on Honeybee and catching up on last season's episodes of Lost. Tomorrow is supposed to be better weather-wise, so I hope to be able to dig my car out of that drift, load Harley into the car, and get to Mom's by noon. Brrr! You'll think our 60-something temps are nice and warm! Merry Christmas! Drive safely when you head out to your Mom's. So with all the snow, do you miss San Antonio yet? The building is probably wrapped in plastic to protect tools and supplies for construction or renovation (another example). We've been having a heat wave here, with daytime highs in the low 40s, but, like one of those famous Christmas miracles, it's 30 this morning... the perfect temperature for late December in Connecticut. My parents and sister siad that you guys were hit by a blizzard. I was so excited to see you talk about Fareway. I love Fareway stores! 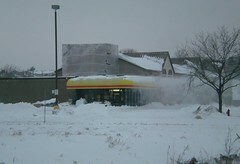 Of course it was the only grocery store there was when I was growing up in rural Iowa. Happy New Year! We've been getting record amounts of snow here, and expecting more tonight and tomorrow.